Collaboration is a major driver of scientific advancement. 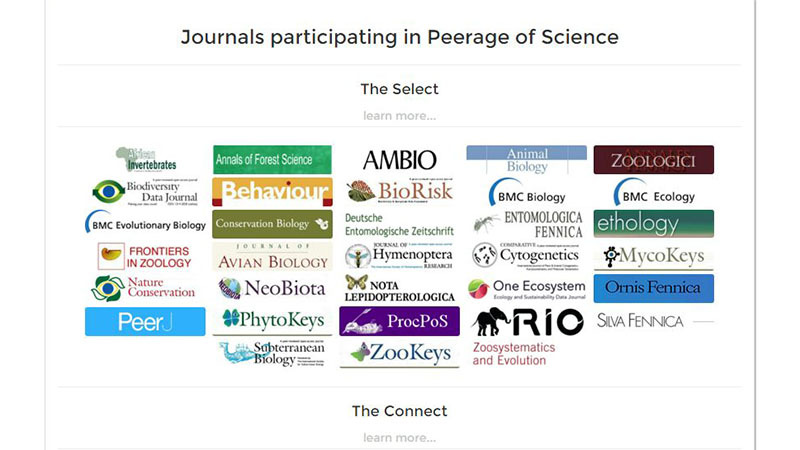 Pensoft recognises this and has now integrated all of its journals with Peerage of Science — a platform with a mission to foster new levels of collaboration between scientists. This integration between two innovative platforms, striving to modernize the publishing industry, provides authors with the possibility not only to receive fast-track high-quality peer review of their manuscripts, but also to have a choice between a pool of journals, when it comes to publication. “Pensoft is a special partner for us, because they were the first publisher to start an official collaboration with Peerage of Science years ago, when we had just launched. Also, Pensoft is in many ways a pioneering publisher seeking to make the world a better place for scientists, with initiatives like the ARPHA writing tool and the RIO Journal,” explains Janne-Tuomas Seppänen, Co-Founder and Managing Director at Peerage of Science. “I am particularly happy that Pensoft is continuing and expanding its support for our solutions for peer review, and brings more journals to the author’s destination menu in Peerage of Science. We warmly welcome the 10 new titles and their editors, and look forward to a long and productive partnership.” he adds. The idea behind Peerage of Science was inspired by the real-world struggles a young scientist is bound to face in the traditional peer-review system. The average peer review process takes more than 160 days and could easily conclude with the paper being rejected. The initiative applies an out-of-the-box approach to the problem, providing a collaborative platform, where peer review takes place before the actual submission to a journal. Thus the process is significantly shortened, while at the same time it secures high quality manuscripts at the end. Similarly, Pensoft journals provide open access, new generation publishing to scientists with an emphasis of online dissemination, data re-use and semantic linking of contents. With its latest projects — RIO Journal and the ARPHA writing tool — the publisher has introduced a new generation of pre-submission and post publication peer review possibilities. Additional benefit for the reviewers is that their reviews will be registered at Publons automatically by Pensoft, if the manuscript is published in a Pensoft journal. Reviewers will be asked for approval of the review registration before it appears in their Publons profiles. “This collaboration works well both for us and for Peerage of Science, but most of all, it empowers the authors to set the deadlines for peer review and choose between publication offers. From the very inception of Pensoft we have striven to provide a fast, reliable and innovative service to our authors, and this new move is yet another building block in this vision.” comments Prof. Lyubomir Penev, Founder and Managing Director at Pensoft.